Sometimes the low season makes me laugh. Do people really believe that it rains every day? Do people hear the words "monsoon" and "wet season" and fear being swept away by floods and typhoons? Or does everyone believe some of the Phuket Weather Forecasts which seem to say the same thing every day ("chance of a thunderstorm")? 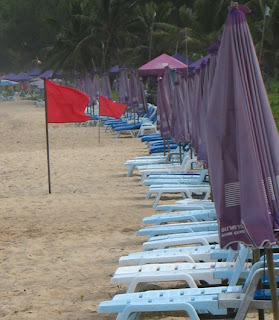 Truth is that the low season/rainy season, call it what you will, is normally a nice time to come to Phuket. I think if you take the time to check some of the monthly archives on this blog, you'll see what I mean. Sure you get some rain, and you do get occasional sh*tty days, but mostly it's warm, sunny (well, partly cloudy) and what's more, Phuket is CHEAP in the low season. Hotels drop their prices to survival level, making a holiday to Phuket at this time of year very affordable. 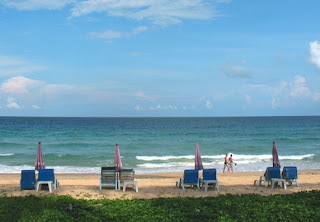 This morning, Karon Beach was looking particularly deserted, but it's yet another beautiful low season day in Phuket. See you soon? Note: see the comments in this post - the red flags are raised for the entire low season no matter what the weather is like. The beach is not "closed", but the prevailing SW winds at this time of year mean that waves can sometimes be quite big at some beaches. Karon is quite long and exposed - waves can be big. Take care. Kata is more sheltered. Do not enter heavy surf if you are unable to swim!